Introduces undergraduate and post-graduate students to the main problems and positions of philosophical logic. 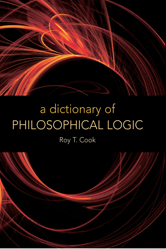 Elements include crucial figures, positions, terminology, and debates within philosophical logic as well as issues that pertain to related, overlapping disciplines, such as set theory and the philosophy of mathematics. Entries are extensively cross-referenced for identification within the context of wider debates.